TVR’s tumultuous history began in 1947, and continues to this day, albeit after many management, ownership, and location changes. Founder TreVoR Wilkinson started TVR in Beverley Grove, Blackpool, building sports cars based on Alvis chassis. 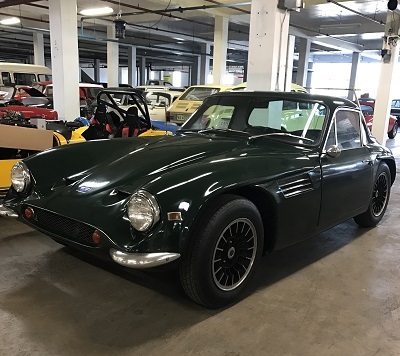 Like Lotus, TVR specialized in fiberglass body-on-frame sports cars using many off-the-shelf components from other manufacturers; unlike Lotus, TVR never really established themselves as a racing car success, although they tried. They were, however, well-known as a low-volume builder of characterful sporting cars. TVR’s tumultuous history began in 1947, and continues to this day, albeit after many management, ownership, and location changes. Founder TreVoR Wilkinson started TVR in Beverley Grove, Blackpool, building sports cars based on Alvis chassis. Like Lotus, TVR specialized in fiberglass body-on-frame sports cars using many off-the-shelf components from other manufacturers; unlike Lotus, TVR never really established themselves as a racing car success, although they tried. They were, however, well-known as a low-volume builder of characterful sporting cars. The Vixen Series 3 seen here was from what TVR aficionados refer to as the “Pre M” era. Its predecessor, the Grantura, and most of the Vixens were built during TVR’s middle period at the Hoo Hill factory in Blackpool. By the late 1950s, Wilkinson had been ousted, and Martin Lilley, a shareholder, had taken over the direction of the company. Lilley had the foresight to hire some talented engineers, and the outdated Grantura chassis was updated with a more modern suspension, a Kamm-back “Manx” tail, and a more performance-oriented Ford-sourced “Kent” crossflow engine. Five months after this car was built, the factory moved to the larger Bristol Avenue facility during Christmastime, 1970, where they remained for 21 years. The Vixen was a sales success and allowed TVR to develop subsequent models such as the M Series, the Tasmin, Chimaera, Cerbera, and Sagaris. As of 2017, TVR is once again trying to revive itself with promises of a new, Gordon Murray-designed and Cosworth-powered model. Although orders for 300 cars are on the books, there is no current factory in which to produce them. The last TVR factory on Bristol Ave., Blackpool, was razed for development in late 2016, and a new facility planned for Ebbw Vale, Wales, is yet to be built. Only time will tell if TVR can make yet another comeback.